Working in a warehouse has unique challenges. Tight spaces, low ceilings, and inadequate lighting can make any job more challenging. How clean your work space is shouldn’t be something you have to worry about. Let us take care of that for you. 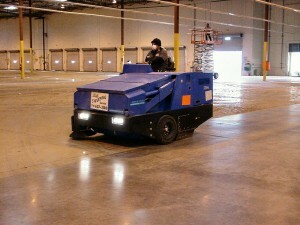 Clean up your warehouse with one of our heavy-duty American Lincoln warehouse sweepers. Best of all, these sweepers have a dry filtration system that filters dust down to 1 micron size so your working environment stays safe and clean. The dust mask you see in the picture is for the dust kicked up by other vehicles driving on the floor, not from the sweeper. Not all floors come this clean in one pass, but this little sweeper can do a great job. They’re perfect for keeping a clean job site or as preparation for handing over the warehouse. Need exact specifications for your project? Dimensions: L=97 in. W=71 in.